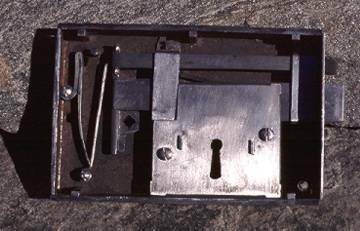 This is a faithful replica of a common English rim lock/latch. 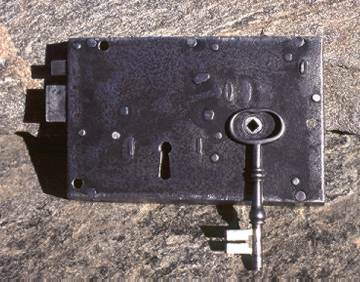 These combination lock/latches were made in England in large numbers throughout the 18th and into the 19th centuries. They were made in many sizes from quite small to rather large (some required a key that measured 8"), and quite a range of finish and quality. All of the locks made by Kevin Moreau are handmade. All of the sheet metal parts are cut by hand with band saw and cold chisel. All of the larger parts such as bolts, lever, padlock shackles, and keys are hand forged, ground to remove scale, and painstakingly hand filed to a warm, visually engaging texture. Each lock is assembled and disassembled several times to assure proper fit and function of the individual parts. These processes are used to maintain a tradition which has not changed significantly since Roman times, when metal locks were first introduced.